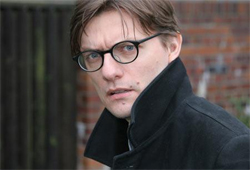 James Urbaniak is an American actor. One of his first noteworthy roles was in the avant-garde playwright/director Richard Foreman's The Universe, for which Urbaniak won an Obie. He has also been acclaimed for his acting in the films Henry Fool and American Splendor, playing legendary illustrator R. Crumb and the play Thom Pain, for which he was nominated for a Drama Desk Award. He provides the voice for Dr. Thaddeus Venture on The Venture Bros., as well as the Doctor's brother, Jonas Venture Junior and the super-villain Phantom Limb. Urbaniak was born in Bayonne, New Jersey. He lives in Santa Monica, California with his wife Julie and their twins, son Severn Jerzy and daughter Esme Maeve. He also recently portrayed the moderator in Human Centipede Anonymous, a Funny or Die short depicting three men who grapple with their past as a Human Centipede.